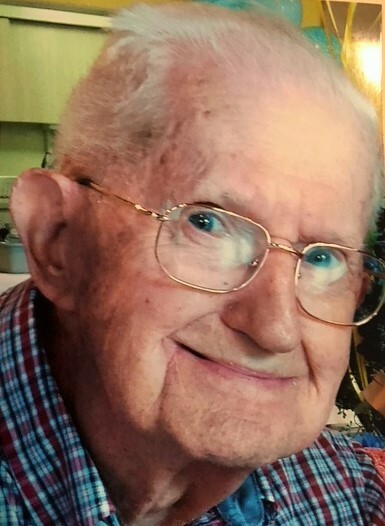 Age 96, of South Webster, passed away Monday, October 29, 2018 at Best Care in Wheelersburg. Born February 20, 1922 at Ashley Corner, he was a son of the late Kendal and Cora (Marsh) Jenkins. He was preceded in death on November 10, 2004, by his wife, Betty (Martin) Jenkins, who he married September 1, 1950. He was also preceded in death by his brother, Harold Jenkins and sister, Catherine Ramsey. Henry is survived by his daughter, Phyllis Jenkins of South Webster; a grandson, Joshua Sloas of Villa Rica, GA, and a sister Maebell Lansing of Bonita Springs, FL; along with several nieces and nephews. Henry spent most of his working life in South Webster serving the public. From selling Ford cars at Simmering’s Ford Garage to selling and working on appliances at F.H. Simmering and Son to managing Simmering’s Lumber Yard and finally retiring at Hammond’s Lumber. After retirement, he enjoyed collecting and rebuilding old gasoline engines and tinkering in his garage. He and Betty enjoyed spending winters in Bonita Beach, FL. Every Sunday was enjoyed dining at one of his favorite restaurants and grocery shopping with his daughter. Henry was baptized at the South Webster Baptist Church. His warm smile and kind heart will be missed. Visitation will be Thursday, November 1, 2018 from 5:00 p.m. until 7:00 p.m. and funeral services will be held at 11:00 a.m. on Friday, November 2, 2018 at D.W. SWICK – NELSON FUNERAL HOME in South Webster, with Pastor Paul Willis Hagen officiating. Interment will follow at South Webster Cemetery. Fond memories and expressions of sympathy may be left at www.DWSwickNelsonFuneralHome.com.